Home > Books > Wake Up, Sun! 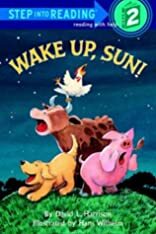 Wake Up, Sun! --2003 publication. Illus. in full color. "A comedy about a menagerie of barnyard animals who mistakenly think the sun has forgotten to rise. Designed for children just beginning to read, the story's vocabulary is simple, yet is smoothly written. A good choice." --Booklist.